I moved into Westmont Town Court, it was close to my daughter, and I have a large room. They serve 3 meals a day, but I have a large refrigerator. They showed us what activities are available, they have 1 big library, and they also have some books in another room. The outside of Westmont Town Court was deceivingly bad, but once inside, the vibe was great. Everybody was friendly and active. It was a good fit for my parents. The food was excellent. The dining area was very nice and very scenic. It opens up to a nice courtyard with a lot of windows. The staff who assisted us was so good. My visit at Westmont Town Court was very good and very informative. I was impressed. It was very lovely with a lot of amenities, it was very clean, the residents seemed happy, the food looked nice, and the rooms looked nice. It was very nice, and I saw a lot of things. I saw them eating, and I saw the gym and the hair salon. I like Westmont Town Court very much. The service is great, and the food is so good. I can't say anything but nice things about this place. My room has a refrigerator, and a nice kitchen. It is a very big room with a screen that divides the living room from the bedroom. The food menu has a lot of variations, and everything is cooked well. I exercise in the swimming pool, and we have poetry, book reading, and bridge. I visited Westmont Town Court. The room was very modern. It was very clean. Everybody seemed very happy. What bothered me about the place was that they have an underground parking garage, and if I would come to visit my brother, it would make me nervous with the underground parking garage because it is not in the best part of town. The staff was very nice though. They knew all the clients' names. They called everybody by name with a big smile. They were having a memory game, and they were playing it with them. The people who could interact seemed to be happy. The dining area was very modern and very clean. It was very bright and sunny. Westmont Court is not new, but it's well-kept and very nice. It had a heated indoor pool, and that was very nice. I've talked to a couple of people living there, and they seemed to like it. There's something for everybody -- like exercise programs. We really liked Westmont Town Court. The facility was beautiful. The people were nice. However, its surrounding was horrible, and it was across the street from a hospital. So, my mother-in-law thought it was going to be really noisy, but the place was beautiful, and the staff was wonderful. Westmont is good; I would recommend it. The rooms were real nice, carpeted, and very clean. Westmont only had private pay, but they referred me to other places, and they were very good. They have very competent, excellent staff. I have my mother in Westmont. It is a very nice place. I’m very pleased with it. They’re very thorough, and they are taking very good care of her. She has a one-bedroom-like apartment. It is very clean, and it is brand-new inside. They have activities. My mother enjoys chatting with the ladies, and playing bingo with them. Westmont Town Court was very nice. It was very acceptable. The studio-type apartment was very good too. However, this facility is probably my second choice only because of financial reasons. I ate there, and the food was very good. The dining room was different than anything I had seen in the 11 facilities that we visited. By that, I mean they have booths, they have tables for four, tables for six, and some tables for two, and that was so appealing. They have the same activities as most all of them that they do for the handicapped, but they have an indoor swimming pool, and that’s super nice. Westmont was fabulous. Everything was beautiful and absolutely fantastic; I would live there myself. There are different rooms to choose from, and Mom’s room is spacious. It was perfect, but she was just not happy, and when one of her sons agreed that she could live with him she moved out right away. The food was great. They have one-bedrooms, two-bedrooms, smaller studios, and bigger studios. There are tons of activities, and I would not have one negative thing to say about it. They had everything, and it was just amazing. I am going to be moving to Westmont Town Court because I liked it the best. It is a one-bedroom apartment with a living room and dining room in one, and a small kitchen, bath, and walk-in closet. You can eat in the dining room anytime you want or cook your own food. The dining room is very nice, the staff is very friendly, and everybody seemed busy and happy. It is a very nice facility. What I liked about Westmont Town Court is that it is recently renovated, they have good views, and their price is good. Mom is in a one-bedroom, and she is comfortable with her room. The facility is clean and it smells clean. The staff are great. The dining area is nice and clean, and the food is a good variety. What I also like about this facility is that when Mom needs to have assisted living, they just bring the services to her current apartment, and she does not have to move. We have come across Westmont Town Court online. They're also in our neighborhood that's how we knew about this place. It was high on our list of consideration for quite awhile now. The facility was pretty nice especially the rooms. They're an older facility but they're remodeling each unit as it comes empty and it was very nicely remodeled. However, some of the floor plans were not conducive to our needs for general purposes. Recently changed from a non-profit facility to a "for Profit" business. They began cutting corners to enhance their profitability. Generic institution food which is just barely average. Staff lack adequate training dealing with the disabled. Recently, one pregnant staff member who was escorting an 86 year old resident to the bathroom, let her fall down and break her ankle. Place needs more training and oversight of staff. Overpriced for level of service to assisted living residents. The Redwood Town Court assisted living community assisted living facility was recommended by friends in the region as an option for our aunt. The outside area resembled that of a high-end, well maintained resort. The stunning pool was the focal point of a private back area that was lovely and refreshing. The center graced a fountain, reminiscent of a palatial estate. The airy interior was very nicely designed and there were gorgeous views throughout. There was bright light everywhere. Because the weather is so mild in San Diego, the residents may enjoy walks along the beach and spend time outdoors year round. The residents enjoy outdoor yoga, swimming and aerobics classes. There is also equipment available indoors for those who desire it. Seniors are encouraged to enjoy physical activity daily. The dining areas offered the kind of meals that could be found in five star restaurants. The food we saw looked and smelled delicious. The menus included food options for all kinds of diets. Private units featured beautifully decorated surroundings, all with very nice views and a lot of light. All had a great deal of fresh air, through very large windows. San Diego offers everything a person could want in the way of relaxation, but also includes cultural fare such as fine dining, art and many interesting activities. The staff appeared to accommodate all levels of ambulation. The seniors appeared content here, with just the amount of care and attention they deserve and need. This community is nothing short of outstanding. The staff is very professional and the community is clean as well as updated. My mother is very happy here and I am so happy with the care and attention that she is receiving. HIGHLY RECOMMEND! Westmont Town Court was older, but they had done some refurbishing. The dining room was beautiful. The rooms were nice. They had parking underground, which was nice. They provided a lot of different activities and had a bus. It was raining when I went, so I didn't really see much outside, but they had a nice outdoor garden area. Everybody was very helpful and very friendly. Everybody was very nice. Westmont Town Court was OK. It is in the middle of the city, and from that point of view, it is a very nice location. They have a pool and a library. The people were very nice. Everything was clean, nice, and well-organized. Thank you for alerting us to your concerns. We are sorry your experience was less than positive and did not meet your expectations. We pride ourselves on responding to customers' concerns promptly to ensure we can make immediate corrections when possible. We have relayed the concerns directly to our team and we would appreciate your time to further discuss any additional specific information that may help us to resolve those concerns. Please reach out to me directly at concerns@westmontliving.com. We value all of our Residents, Families and Guests and your insight is of the utmost importance to our Westmont Living Family. I went to Westmont Town Court. They have all levels of care. We had seen one or two before this, and the feel in this place is so homey and so inviting. The staff was very knowledgeable. They had lots of activities. The rooms were very nice. Depending where your room was, there's a great view out the window. Also, their pricing was better than the others we had gone to. They are a little more reasonable. We had a chance to visit Westmont Town Court, which had more than adequate amenities. The rooms that they showed us were very nice. Their dining facility was very nice as well. They had an OK library. I think they were doing some carpet renovations. We are living in Westmont Town Court. We like everything about it very much. The meals, the area, and the swimming pool are fantastic. The meals are included in the basic monthly fee. We can also have a couple of family members come in now and then for a meal. We just can't be happier with them. I am living at Westmont Town Court. They have all of the general amenities and facilities, like transportation to doctors and grocery stores, errands and three meals a day. Sometimes they're very good, sometimes they're medium and sometimes they're not good. There's nothing really special, but their fee is good for me since it's cheaper than other places. I have a small one-bedroom, and a full-range kitchen. I have a range, an oven, a microwave, and a refrigerator. They have small, medium, and large one-bedrooms. The location is very good here, too. The dining area is fine. We have a library area with books. We have bingo and little games and exercise programs for older people. They have assisted living. The facilities were fine at Westmont Town Court. I was concerned because it is in the older part of downtown Escondido, and they were unsure about whether they could take my dog. The rooms were certainly comparable to the other facilities that I visited. The only other concern I had about it was their fire protection system; if there was a fire, you’re supposed to stay in your room until they come and get you. The staff was fine, though. Westmont was OK, but I wasn’t impressed with the location. However, I liked the area and the units. They had some very large units, which was what I was looking for. There has been a change in ownership at Westmont Town Court right now and I am kind of seeing what kind of changes with this new ownership although it has been fine since I came in here. This place feels homey. I just feel that the security is not the greatest and I think it could be change. Describe the overall population of assisted living residents at Westmont Town Court. What is their average age? What are their favorite things to do? Our community has about 65% independent residents. The average age is early 80's. The most popular thing to do at our community is indoor pool exercise. What programs or activities does Westmont Town Court offer to enrich residents' well-being? Organized exercise classes seven days a week including yoga and chair chi. What places are near Westmont Town Court or within walking distance for assisted living residents to enjoy? Grand Avenue offers shops and restaurants. What transportation services does Westmont Town Court offer to assisted living residents? We offer transportation six days a week. We have a shuttle bus and a car. What makes the chef or dining program at Westmont Town Court exceptional? What kind of menu can assisted living residents expect? Our Chef offers Chef talk once a month to discuss the menu with our residents. What safety features or security measures does Westmont Town Court offer to assisted living residents? We are a completely gated community and video monitored. You must gain access at the front entrance by our concierge. If Westmont Town Court accepts dogs or cats, what indoor/outdoor areas can they enjoy? We have a pet park within the community. 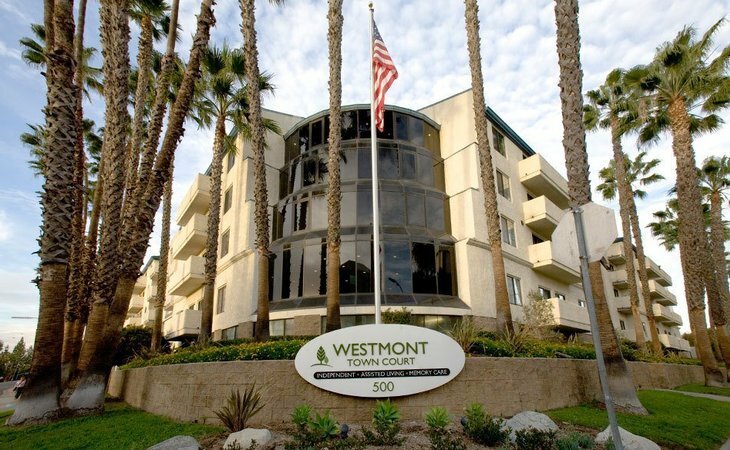 Located in the vibrant North San Diego County, Westmont Town Court is a one-of-a-kind independent and assisted living retirement living community designed with your individuality in mind. Our convenient location to downtown Escondido is close to shopping, dining and a range of cultural and entertainment venues - perfect for a leisurely stroll and engaging activities. Make yourself at home here at Westmont Town Court where a happy, healthy lifestyle goes hand-in-hand with your personal fulfillment, enrichment, and growth. That's why everything you'll find here was designed to celebrate your individuality, create a natural sense of community and provide a comfortable, inspiring place to call home. Enjoy a water aerobics class in the indoor heated swimming pool, find a good book to read in the library, join a work-out group in the fitness center or just enjoy a fine meal in the restaurant. Whatever your likes you're sure to find it at Westmont Town Court. What should caregivers and potential residents know about Westmont Town Court?